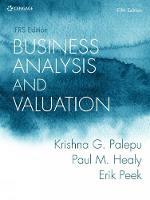 Business Analysis and Valuation: IFRS edition uses a wide range of contemporary cases to illustrate the use of financial statement data in various valuation tasks. Centred around the IFRS Standards, this text demonstrates how to get the most information out of IFRS based financial statements. The focus is not only on building a solid understanding of the latest theoretical approaches but also placing students in a confident position to apply these.